The vehicle offers a selection of ultra-modern assistance and comfort features. Adaptive Cruise Control with pedestrian detection and Automatic Emergency Braking, Driver Drowsiness Alert, and Advanced Park Assist are just some highlights. 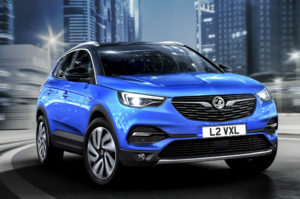 At 4,477mm long, 1,844mm wide and 1,636mm high, the new Vauxhall Grandland X is a robust SUV from every perspective. Above the front skid plate, the bold grille proudly displays the Vauxhall Griffin. The chrome winglets embrace the brand logo and flow outwards to the slim, double-wing LED headlamps, visually widening the front and giving the Grandland X a powerful, solid stance. The bonnet features the signature Vauxhall crease – an expression of the Vauxhall design philosophy of sculptural artistry and technical precision. The Grandland X has the same quality on the inside: the instrument panel and centre console with touchscreen are clearly laid out and horizontally aligned to the driver. The centre stack has three horizontal rows of controls for fast and easy access to infotainment, climate control and chassis functions.